When we make a profession of faith in Jesus Christ, we place our trust in him for all things, in this life and in the life to come. The fullness of this commitment goes beyond an emotional decision or an intellectual judgment. To believe in Jesus is to become a part of his body, the church. It is a personal decision with profound social implications. And we might clarify it further in noting that being a Christian is not a static place of rest; we are followers of Jesus, on a journey, led to destinations that are not always within our strategic plans! This is what it means to embrace the Lordship of Jesus Christ. And it is, for any of us who have stepped forward in faith, a challenge. The difficulty in the Christian way is not Jesus himself; the challenge lies within us and beyond us--in the language of the gospel hymn, the "fightings and fears, within, without." The inner struggle, if we are honest, is that we resist change, which is precisely the work (of repentance) that Jesus does when he enters. And so we may try to compartmentalize the spiritual life to a particular time (Sunday) or place (the church building) or location (heart). This internal division is not only dishonest and deceptive; it is an obstacle to the wholeness (healing) that Jesus offers, and the grace and justice that God desires in all of life. The external challenge lies in the imperfections that are present in others: if we are laity, we may see them in the clergy; if we are clergy, we notice them in the laity, or perhaps in our colleagues. If we are passionate about a particular issue, we are impatient with those who do not share our convictions. And then there are the natural preferences that are not shared by all alike, even in the smallest of groups: leadership styles, musical genres, missional priorities. At times we avoid the difficult spiritual work of discipleship by evading responsibility for our own spiritual health, or denying our complicity in the brokenness of our communities, or by fleeing from congregations (or denominations) that disappoint us as they (inevitably) fail to meet our aspirations. This avoidance is a natural human tendency, for self-examination (examen) and deep relationships (koinonia) require sustained spiritual practices and costly personal and corporate behaviors: the New Testament speaks of "dying to self," "thinking more highly of others than ourselves," and offering our bodies as a "living sacrifice." We are living in the days between Easter, with the gift of the resurrection, and Pentecost, with the promise of the Holy Spirit. At a human level, we are given hope for positive change, even a new creation, and yet we know that, in ourselves, we lack the energy or desire to sustain such a transformation. The experiences described at the end of each gospel--disillusionment, confusion, fear, grief, exhaustion--are present at times among the most dedicated believers and disciplined leaders in the church. The "in-between" time--between anticipation and fulfillment, memory and hope--can be disorienting. And yet the Great 50 Days are a fertile season in the life of God's people. 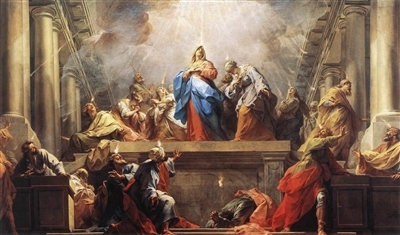 And so we rejoice in the good news of Easter, we pray, fervently, for the coming of the Holy Spirit at Pentecost, and we claim the promise of the scriptures: "God who began a good work in us will be faithful to complete it" (Philippians 1:6).